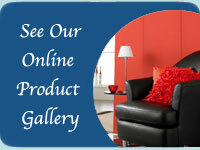 Roller Blinds - Roller blinds are a practical choice for any room. They can be operated by a side action control for ease of use, or can be spring loaded. They are available in many colours and designs, with a choice of a straight finish, or a shape with the option of an added pole. Vertical Blinds -The perfect way to finish any window in a house or office. Vertical blinds can give you complete control of the sunlight by rotating the vanes to allow as little, or as much light as required. They are easy to install and operate. Vision Blinds - consisting of a solid and sheer horizontal panel fabric Vision Blinds work by rolling against each other. This allows you to adjust how much light shines through and give you control to choose how much vision you prefer. There modern style has allowed Vision Blinds to grow very popular recently. Vision Blinds are available in a range of different sizes and options. They are suited for any room. Please contact W & P Blinds to more information. Wooden venetian blinds can add a special touch to any window. They are available in a choice of 25mm, 35mm, 50mm and 63mm slats, and in a range of colours. Solid wooden eco-friendly blinds are also available, where the wood has been sourced from sustainable forests. Aluminium venetian blinds are a practical choice for many windows in the house or office, as they are easy to control. They can be made in a range of slat sizes from 16mm to 50mm, and in a variety of colours including metallic finishes. An option of perforated slats is available, which are ideal where privacy is required. Pleated Blinds - Pleated blinds are the best choice for the conservatory roof. The fabric is pleated to form a continuous sunblind, which can be opened or closed to control the amount of light required. Pleated blinds prevent the conservatory from becoming uncomfortably hot in the summer, whilst helping to retain heat in the winter. They are available in standard colours that are light filtering, or in an energy saving version for complete control of light and heat. Skylight Window Blinds - These blinds can be made-to-measure and are available in wide range of styles. 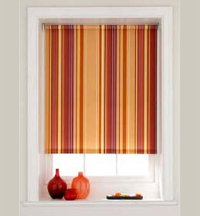 They can also be made with blackout fabric which provides total privacy, light control and thermal insulation. Roman Blinds - Ideal for a range of room types. They are easy to raise and lower and the shades fold and unfold neatly to the length that you require. Awnings - Our retractable patio awnings can help you to make the most out of your outside space, as they can provide a great socialising area that can be used whatever the weather. We tailor make awnings and can cater for a range of budgets and tastes. We have supplied blinds to many homes and businesses (including cafés and schools). 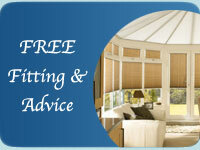 We are also experts in supplying and fitting conservatory blinds. All of the above products are available in a wide range of styles from plain colours to more elaborate designs there is something to match every taste, budget and lifestyle. 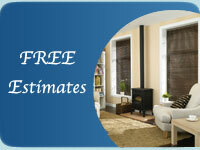 We are also happy to offer you advice on which blinds will best compliment your interior. View our blind and awning product gallery to see some of the types of products we can supply and fit in your property. All of our clients receive a professional and cost-effective service - read our testimonials to see what our satisfied customers have to say. We have a strong working relationship with a range of blind and awning manufacturers including: Eclipse and Arena, and Broadview. We also work closely with sign writing company Urban Sign Solutions who create excellent signs and can add any lettering and logos to your awnings or Dutch blinds.